For the activity house Vesterbro Youth Farm, designed by RIA Architects, Art Andersen developed, produced and installed indoor, dynamic, wood covered shutters which enable total screening of the north and south facades of the building. The house is used for several purposes – from ball games to chamber music concerts. Consequently there are tough requirements to the acoustics and light conditions. 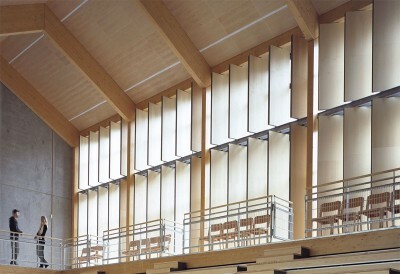 Art Andersen solved the assignment with 75 silent electrically operated louvers clad in maple wood veneer. The upper and lower louvers can be operated separately. Apart from fulfilling functional requirements through Art Andersen’s advanced design, a complete and aesthetic solution was created – with all mechanical components installed below floor level.